Xu Bing, the renowned Chinese artist whose many laurels include a MacArthur Foundation "genius" award and an appointment as vice president of China’s Central Academy of Fine Arts, has long demonstrated a fascination with the written word. Like Leopold Bloom — the main character in James Joyce's novel Ulysses, which also takes place within a single day — the main character of From Point-to-Point is something of an Everyman. But, where Bloom is a hero, a latter-day Odysseus, Xu's Everyman is an icon — that is, an actual icon. Indeed, if this plot summary sounds slim, consider this: From Point-to-Point is "written" without a single word — at least as they are traditionally defined. Instead, it is composed with hundreds of icons, or pictograms, that Xu has been collecting for years. Where Book from the Sky can be read by no one, Book from the Ground can be read by any one. It is, in other words, a remarkable effort to create a universal form of written communication that transcends cultural, linguistic, class, and educational backgrounds. In Xu's words, "The illiterate can enjoy the delight of reading just as the intellectual does." 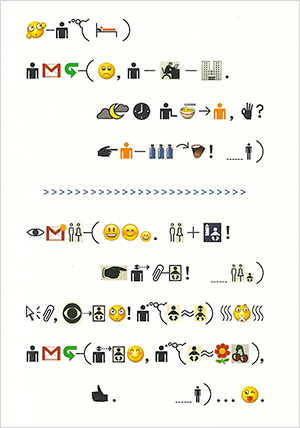 Xu, in conversation with me and my husband, and in an essay he wrote about the Book from the Ground project, explains that the idea came to him during the many hours he spent in airports and on planes, where he regularly encountered pictograms. He began to study airline safety cards, which he calls “humanity’s earliest examples of common knowledge texts.” Then, in 2003, he saw a pack of chewing gum that had written on it, in pictograms, “after use, please wrap in paper and dispose in trash can,” and was inspired to begin collecting enough pictograms to tell a larger story. He argues that we are only now realizing the true significance of the Tower of Babel — our languages have stagnated and are utterly unsuited to the global village in which we live. Philosophers have long dreamed of a shared language (and in the 17th and 18th centuries, some of Europe’s greatest minds thought this language could be rooted in Chinese) but in today’s world, it is increasingly a necessity as much as an ideal. And, thanks to global marketing images and icon-based computer commands, we are increasingly primed to “read” visual symbols. This all makes great sense and I certainly think the MacArthur committee got it right when it deemed Xu a “genius.” But for one who is as possessed as I am by the power of the written word, From Point-to-Point was a challenging read. I marveled at its beauty on the page but was frustrated by the absence of lyric and poetry, which are so anchored to sound, and annoyed by the clumsy manner in which my brain “translated” the pictographs into words and sentences I could comprehend. Simple though the plot is, there were also parts I frankly didn’t get because I didn’t understand the icons. (Fortunately, I had readily available translators in my eleven-year-old son and nine-year-old daughter, who instantly accepted the premise of a book of icons and had little problem following the story.) I also got a bit tired of story’s emphasis on bodily functions and bathroom humor, and the lack of big ideas — but, then again, I feel that way about much of contemporary fiction. Xu shares this frustration — he professes embarrassment at having to resort to standard written language in order to explain the premise of his pictographic script. But, as he says, the significance of this effort is in the attempt and all written languages go through lengthy periods of development. Book from the Ground: From Point-to-Point is a work in progress — it is also a genuine work of art. Sheila Melvin writes about culture in China. She is a regular contributor to the International Herald Tribune and Caixin, and her articles have appeared in numerous other publications.